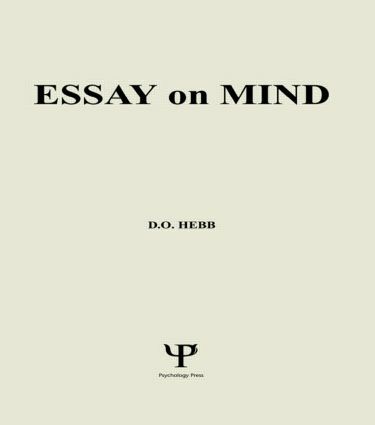 Donald Olding Hebb, referred to by American Psychologist as one of "the 20th century's most eminent and influential theorists in the realm of brain function and behavior," contributes greatly to the understanding of mind and thought in Essays on Mind. His objective was to learn about thought which he considered "the central problem of psychology -- but also, not less important, to learn how to think clearly about thought, which is philosophy." The volume is written for advanced undergraduates, graduates, professionals, and lay people interested in or studying the mind. Hebb offers an increased understanding of the mind from a biological perspective that affects long-standing philosophical and psychological problems. "Psychology and Philosophy were divorced some time ago but, like other divorced couples, they still have problems in common," writes Hebb. The first three chapters establish the methodological and philosophical basis for his biologically centered theory of behavior, including the evolution of the mind, nature versus nurture, the origination and status of cell-assembly theory, and infant thought and language development. He concludes with a discussion of the workings of scientific thought from a practical rather than theoretical perspective. Mind as a Biological Problem. Self-Knowledge and the Self. Biological Threads in the Philosophic Fabric. The Evolution of Mind and Behavior. Heredity, the I.Q., and Attendant Confusions. A Psychological Theory. Perception and Cognitive Development. The Structure of Thought. Scientific Law in Human Thought. A World of Thought.